1957 Original TV/Radio Life Magazine "Broken Arrow"
1957 "TV Life" Magazine. Early Program Guide to both radio and TV. 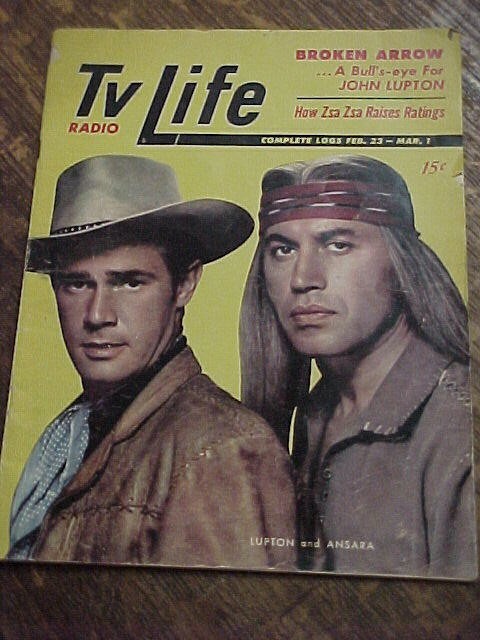 On the cover the famed series "Broken Arrow" starring John Lupton and Ansara. This is the era when most Television Shows were "Live" and unrehearsed. Fasinating to read ads, and shows that were on. Pictures of Sherrif John, Zsa Zsa Gabor and numerous others. Rare Collectible. 1957 "TV Life" Magazine. Early Program Guide to both radio and TV. On the cover the famed series "Broken Arrow" starring John Lupton and Ansara. This is the era when most Television Shows were "Live" and unrehearsed. Fasinating to read ads, and shows that were on. Pictures of Sherrif John, Zsa Zsa Gabor and numerous others. Rare Collectible.. Please email cowboycabin@centurytel.net with questions or call 406 270-2842.